Sunbrella is an outdoor décor fabric that is water and sun resistant. It can also be used indoors because of its renowned durability and stain resistance, which makes it a great upholstery and slipcover fabric for kids and pets. 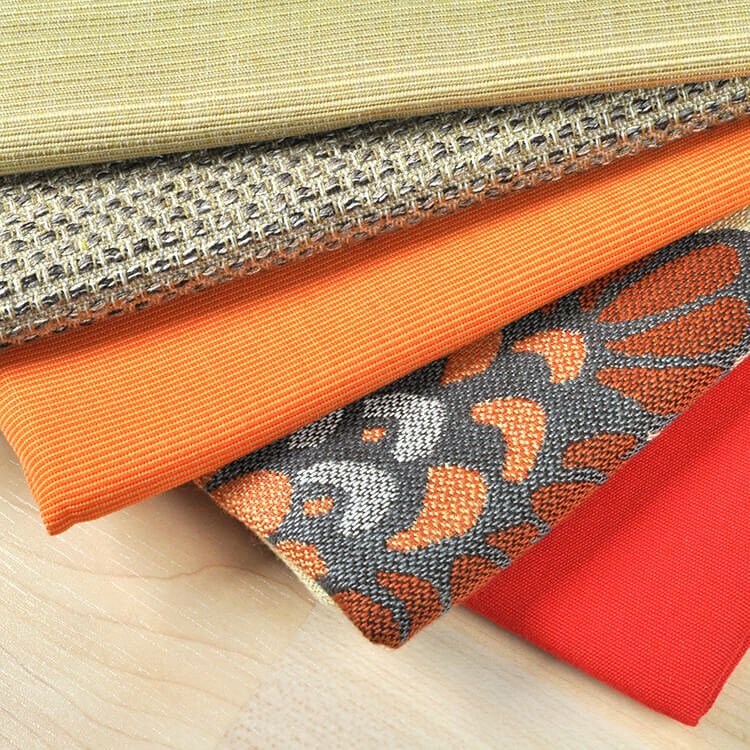 Upholstery Sunbrella fabric has a soft hand and can wrap easily around curves and corners, making it great for outdoor furniture and boat interiors. Upholstery Sunbrella comes in different weights and there are also specialty weave patterns and jacquards for a more decorative look. Sunbrella also makes a stiffer fabric for awnings and marine uses. Shop all Sunbrella fabric here. There are many different varieties of Sunbrella. Sunbrella Canvas is the most prevalent kind and is available in dozens of solid colors. It’s made out of Sunbrella acrylic that’s UV resistant, mildew repellent, bleach cleanable, fade resistant, breathable, and has minimal shrinking or stretching. It has a soil, stain, and water repellent finish. It’s a medium weight at 7.9 oz per square yard. Sunbrella Spectrum is a little lighter weight at 6.3 oz. It has the same finish and is also mildew repellent, bleach cleanable, and fade resistant. Sunbrella Heritage fabric is made of 50% Sunbrella acrylic and 50% recycled Sunbrella acrylic. It’s a heavier weight at 10.5 oz and is very durable. Other varieties, including Dupione, Mainstreet, and Sailcloth, range from 8 to 12 oz. There are also stripes, florals, geometrics, and other patterns weighing up to 14.4 oz. All of these fabrics are very durable and can be used in outdoor, indoor, and marine environments. Sunbrella is popular for indoor upholstery that gets a lot of wear and tear from kids and pets because of how well it resists stains. Awning and Marine Sunbrella is a stiffer fabric that’s mainly used for awnings, shade structures, and boat covers. This Sunbrella fabric has a fluorocarbon top finish that provides UV resistance, stain, and water repellency. It’s also heat sealable with seam seal tape. Check out our selection of Sunbrella fabric! which is the softest sunbrella fabric for outdoor cushions? Is outdoor fabric hard to sew? how to make covers for a chaise? This tutorial is for a chair but the same techniques would be used for a chaise. Is it possible to make your own outdoor umbrella replacement cover? BEST ANSWER: Yes, this would be an appropriate use for Sunbrella fabric, especially the Awning/Marine Sunbrella fabric. what exactly is a flourocarbon finish? Does that mean it has chemicals on it that will be dangerous, similar to scotch guard? covering, and floor covering. In 2000, 3M changed the formula used in Scotchgard so the environmentally harmful chemical is no longer used. Can I use the lighter fabrics to make some ft carrying bags ? BEST ANSWER: I'm not sure what kind of bags you're referring to but Sunbrella fabric would be great for most kinds of bags. How long does it take for a slip covered cushion to air dry after washing? BEST ANSWER: Hard to say as it greatly depends on the conditions like temperature and humidity. We'd guess at least a couple of hours, possibly longer. Can you make slip covers out of your fabric. Can the covers be washed or cleaned ? BEST ANSWER: Yes, Sunbrella is great for slipcovers because it is durable and stain resistant. What type of sunbrella fabric would you recommend for indoor window treatments (roman shades)? BEST ANSWER: Any of the Sunbrella fabric, other than the Awning / Marine fabric, would work for Roman shades. You can order samples if you want to see it in person. Can you use it as an ironing board cover? BEST ANSWER: We would not recommend it because Sunbrella is made out of acrylic which is not as resistant to high heat as cotton is. Is Sunbrella soft enough and strong enough to be used in a hammock? BEST ANSWER: Upholstery Sunbrella fabrics should work.